Two years ago, Dr. Nada Jabado, hemato-oncologist at the Montreal Children’s Hospital, and researcher in the Child Health and Human Development Program at the Research Institute of the McGill University Health Centre (RI-MUHC), approached Dr. Jean-Pierre Farmer, neurosurgeon and Chief of Surgery at the MCH, about a promising discovery for treating brain tumours. She explained that a mutation—known as BRAF V600E—found in a certain type of melanoma was the same mutation found in a subset of brain tumours known as gangliogliomas. What’s more, drug treatments using targeted inhibitors with proven clinical success in treating melanoma were available. Dr. Jabado suggested that these same treatments could be used to target gangliogliomas that carried the specific mutation. The first patients in Quebec to take one of these drugs were a young girl and a teenage boy, both diagnosed at the Children's, who had tumours that could not be completely removed by surgery. They had failed several therapies, including radiation therapy, but within a month of starting the targeted treatment, their tumours shrank. The positive outcome from their treatment paved the way for another young patient this past fall. Dr. Farmer suspected that Karl’s tumour was a ganglioglioma but the only way to confirm a diagnosis is by biopsy. Gangliogliomas are low-grade tumours which occur most frequently in the brain. As the tumour grows, it can lead to symptoms such as seizures, fatigue, or weakness on one side of the body. 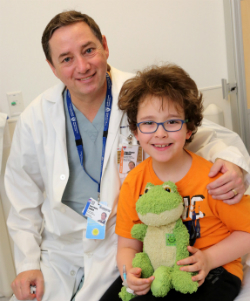 “The BRAF mutation that is common to both melanoma and a subset of gangliogliomas opened the door to consider the drug treatment for children with these types of gangliogliomas,” says Dr. Jabado. 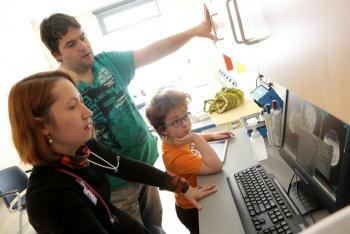 “For Karl, as for any child who is a good candidate for the treatment, providing an option that is this effective with minimal side effects is very promising.” (Photo left: Dr. Legault, Marc and Karl look at results from his MRI scans). Karl’s tumour has responded well to treatment. Three weeks after he started the therapy, his tumour shrank by 50 per cent and he regained use of his right hand. 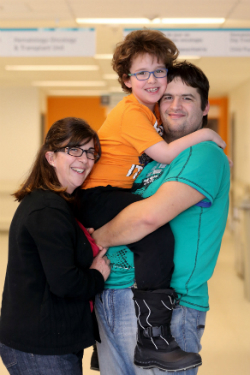 By the time he had his third MRI in November, the size of his tumour had decreased by 75 per cent. He and his parents now come to the Children’s every month for check-ups. The tumour is stable and hasn’t moved so he’ll continue on the drug treatment for the foreseeable future.